Sports are group games and individual activities involving physical activity and skills. Sports help children develop physical skills, get exercise , make friends, have fun, learn to play as a member of a team, learn to play fair, and improve self-esteem . Participation in sports is a great way of staying active and offers wonderful rewards for mental health. Being involved in sports has been proven to help children learn valuable skills for dealing with life's ups and downs. They teach youth how to interact with others and work as a team. This skill facilitates working with others in other ways such as on a class project or a school play. Sports also help students become more independent and feel better about themselves. The result is positive self-esteem and self-confidence, which are extremely important for determining later happiness and success. Sports also offer an enjoyable, exciting environment in which to learn how to handle both failure and success. Everyone wins and loses some of the time in both sports and other endeavors. Winning feels great and empowering but can also cause a young person to feel pressure and anxiety in the next attempt to win. Losing usually produces feelings of sadness, depression, and disappointment. Learning how to cope with these different feelings fosters good mental health. Another aspect of sports that contributes to a healthy mind is goal-setting. Young people who have goals are more likely to be self-motivated and are usually able to accomplish more because they know what they need to do in order to get ahead. Without goals, adolescents tend to lack direction and focus. In sports, goal setting is essential for improving individually and working as a team. This is also true in other pursuits. For example, if a student wants to get better grades, reaching specific goals, such as studying for a certain period of time each night, is the most likely way to achieve them. SPORTSMANSHIP American sports culture has increasingly become a business. The highly stressful and competitive attitude prevalent at colleges and in professional sports affects the world of children's sports and athletics, creating an unhealthy environment. The attitudes and behavior taught to children in sports carry over into adulthood. Parents should take an active role in helping their child develop good sportsmanship, according to a 2002 health advisory issued by the journal Clinical Reference Systems. EXTREME SPORTS Extreme sports in the early 2000s are becoming increasingly popular among young people. They offer the thrill of facing difficult challenges and overcoming obstacles. Extreme sports get the heart racing and put the body and mind to the test in the face of danger. However, with the many physical and mental benefits of extreme sports comes the risk of injuries. It is essential to work with a trained instructor and use the necessary safety equipment when doing any kind of extreme sport. Extreme sports are not for everyone. However, those looking for bigger challenges in their quest for physical fitness have many options, including rock and ice climbing, surfing, whitewater rafting, wakeboarding, water-skiing, mountain-bike racing, bicycle stunt-riding, skydiving, skateboarding, and extreme snowboarding. There are many camps around the country that teach extreme sports to kids and teenagers. Anyone can find the nearest extreme sports camp or more general information by typing "extreme sports" on any Internet search engine. There are thousands of Web sites devoted to these activities. An infant is capable of participating in only a limited amount of athletic activity. Still, many parents worry about their child's motor skill development and wonder how they can help develop these skills. The American Academy of Pediatrics (AAP) advises parents that normal play with adults is more than enough physical stimulus to encourage normal development of motor skills. In years of research, no one has produced any evidence that increased stimulation of infants increases development of motor skills in later years. Swimming is perhaps the only sport infants are really able to participate in. While infants instinctively hold their breath when immersed in water, pediatricians warn that they also swallow water, which can produce hazardous side effects. The AAP advises that infants should not participate in swimming activities until they are at least four months old. Toddlers are naturally curious and exploratory, leading them to develop independence skills such as walking and talking. These should be encouraged by adults, as should frequent interaction with other children their own age. Athletic activity at this age should be free form and spontaneous, with adult interference or direction held to a minimum. The AAP suggests that adult intervention, such as teaching a child to throw and catch a baseball, has little effect on later motor skills development, and they warn that the repetition of such practicing often stifles the natural urge to play creatively. It has also been shown that until children reach ages of five to seven, their vision is not sufficiently developed to follow objects that are moving quickly through their line of sight, such as thrown balls. Children are not little adults when it comes to sports and physical activities. As reported in Heidi Splete's article on age-appropriate sports skills, Sally Harris, a pediatrician at the Palo Alto Medical Clinic in Palo Alto, California, asserts that early childhood sports should focus on skill development rather than competitiveness. Activities should allow children to learn by trial and error with minimal instruction. Competition is mostly a distraction for preschool-age children. Appropriate athletic activities for children of this age are dance, beginning gymnastics (primarily tumbling), and swimming. Free-form play with peers is probably most important, both for its socializing effect and for the creative expression it offers. Sports activity in early childhood should have three basic components, according to Harris. They are acquisition of basic motor skills, social development by the child's interaction with coaches and teammates, and cognitive development in understanding and following instructions and executing strategy and tactics. By the age of five or six, children begin rapidly developing motor skills. Also, posture and balance become automatic, and reaction times become faster. However, learning complex rules is often difficult and trying to teach a child a sport requiring a great deal of instruction, such as baseball, football, or soccer, may only cause frustration and a lack of interest. A child's inability in these areas can also cause a sense of failure and provoke a life-long aversion to organized sports. One good way to get a child interested in sports during these years is to engage in physical activity the whole family can participate in, such as taking long walks or bicycle rides. Most pediatricians suggest that complex team sports that require coaching or memorization should be postponed until a child reaches the age of nine or ten. Between the ages of six and nine years, beginning soccer and baseball are appropriate sports, especially if the focus is on getting children interested in sports or physical activity. By the time a child reaches adolescence , his or her interest in sports is most likely at its peak. Children of this age often collect sports memorabilia, wear clothes resembling the uniforms of their favorite players, and spend larger amounts of time watching, participating in, and talking about sports. At ages 10 through 12, children can improve traditional athletic skills and master complex motor skills. They are able to play sports involving strategies and teamwork, but growth spurts can bring physical and emotional changes that parents and coaches should be aware of, according to Harris. In the last several decades of the twentieth century, there was a dramatic decrease in the number of school districts that require physical education classes for students. As a result, the U.S. Department of Health and Human Services set an objective to increase the number of children six years of age and older who exercise on a daily basis at light to moderate levels for at least 30 minutes. A 2002 survey of student participation in extracurricular sports activities at middle schools showed a typical program was offered on average 3.6 hours per week. It also revealed that 26.7 percent of boys and 22.9 percent of girls participated in the activities. The most commonly offered activities at middle schools surveyed were basketball (31.7%), track and field (10.3%), soccer (9.4%), tennis (6.7%), and football (5.4%). Since the middle schools offered a small number of sports activity programs, the survey recommends middle schools add a variety of noncompetitive activities, such as dance, aerobics, martial arts, jogging, walking, and yoga . Providing programs that appeal to a wider range of students at all grade levels of middle and high school would likely increase participation in extracurricular sports and physical activity programs. The social benefits of athletics are especially important for young girls. In fact, it has been argued that girls are more in need of the benefits of athletics than boys. Adolescent girls tend to have lower self-esteem than boys, and many suffer from the false belief that their bodies are useful only to the extent that they are attractive to boys. Statistics compiled by the Women's Sports Foundation also demonstrate that young female athletes receive substantial benefits from participation in sports. They found that girls who participated in school athletics are 92 percent less likely to use drugs, including tobacco and alcohol; and 80 percent less likely to get pregnant. Additionally, they are three times more likely to graduate from college. The most common problem in adolescent sports is sports-related injuries. An estimated 30 million children in the United States play in organized sports but about 35 percent drop out each year, usually due to physical injury or emotional stress. Each year, hospital emergency rooms see more than 2.6 million sports-related injuries in young people, according to an article in the April 8, 2002 issue of U. S. News & World Report. Among children ages 5 to 14 years, the top sports injuries annually are: bicycling, 336,250; basketball, 193,400; football, 185,740; baseball and softball, 117,250; and soccer, 85,430. The number of other sports injuries include skateboarding, 49,930; hockey, 25,400; and gymnastics, 26,950. Among young people ages 15 to 24 years, the top sports injuries are: basketball, 277,00; football, 171,290; bicycling, 95,720; baseball and softball, 88,340; and soccer, 68,790, according to the article. Other sports injuries included general exercising, 38,560; snowboarding, 29,700; hockey, 28,070; and skateboarding, 27,470. What is the level of the coach's education? Does it include training in cardiopulmonary resuscitation (CPR) and first aid? What does the coach do when an injury happens? What is the protocol for returning to play following an injury? Is there an on-site athletic healthcare provider or consulting team physician? Does the coach knows about any health conditions of the child and have phone numbers where parents can be reached in an emergency? Are there emergency medications available for children with asthma or allergies? What are the inclement weather guidelines, especially for lightning storms and extreme heat? Is the athletic equipment safe, properly fitted, and in good condition? If a child receives a soft tissue injury, such as a strain or sprain, or a bone injury, the best immediate treatment is ice, compression, elevation of the injury, and rest. Get professional treatment if any injury is severe, such as a fracture, profuse bleeding, dislocated joint, prolonged swelling, or prolonged or severe pain . Playing rigorous sports in the heat requires close monitoring of both body and weather conditions. Heat injuries are always dangerous and can be fatal. Children perspire less than adults and require a higher core body temperature to trigger sweating. Heat-related illnesses include dehydration , heat exhaustion ( nausea , dizziness , weakness, headache , pale and moist skin, heavy perspiration, normal or low body temperature, weak pulse, dilated pupils, disorientation, and fainting spells), and heat stroke (headache, dizziness, confusion, and hot dry skin, possibly leading to blood vessel collapse, coma, and death). Professional medical help should be sought for heat stroke, heat exhaustion, and any other heat-related illnesses that do not quickly clear up. Erickson, Darrell. Molding Young Athletes: How Parents and Coaches Can Positively Influence Kids in Sports. Oregon, WI: Purington Press, 2004. Fish, Joel. 101 Ways to Be a Terrific Sports Parent: Making Athletics a Positive Experience for Your Child. New York: Fireside, 2003. Malina, Robert M., and Michael A. Clark. Youth Sports: Perspectives for a New Century. Monterey, CA: Coaches Choice Books, 2003. Shannon, Joyce Brennfleck. 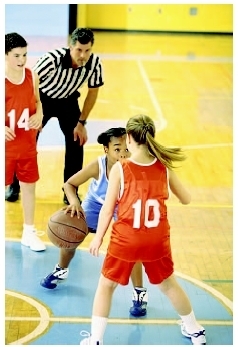 Sports Injuries Information for Teens: Health Tips about Sports Injuries and Injury Prevention. Detroit, MI: Omnigraphics, 2003. Goldberg, Michael J. "Kids Dropping Out of Sports." Pediatric News (February 2002): 25. Ishee, Jimmy H. "Participation in Extracurricular Physical Activity in Middle Schools." The Journal of Physical Education, Recreation & Dance (April 2003): 10. Children participating in a basketball game. Metzl, Jordan D. "Sports Should Be About Fun." Pediatric News (October 2002): 32. Splete, Heidi. "Developmental Stages of Sports Readiness Can't Be Rushed: Accept Some Level of Chaos." Family Practice News (Sept. 1, 2002): 33. ——. "Work on Age-appropriate Sports Skills: How Much, How Soon?" Pediatric News (October 2002): 28. National Institute of Arthritis and Musculoskeletal and Skin Diseases. 1 AMS Circle, Bethesda, MD 20892. Web site: http://www.nih.gov/niams. "Children and Sports." American Academy of Child & Adolescent Psychiatry , January 2002. Available online at http://www.aacap.org/publications/factsFam/sports.htm (accessed October 14, 2004). "Sports Injury Prevention: Children and Adolescents." Safe USA , July 14, 2002. Available online at http://safeusa.org/sports/child.htm (accessed October 14, 2004). Cognitive ability —Relating to the process of acquiring knowledge by using reasoning, intuition, or perception. Heat exhaustion —A condition of physical weakness or collapse often accompanied by nausea, muscle cramps, and dizziness, that is caused by exposure to intense heat. Heat stroke —A serious condition that results from exposure to extreme heat. The body loses its ability to cool itself. Severe headache, high fever, and hot, dry skin may result. In severe cases, a person with heat stroke may collapse or go into a coma. Motor skills —Controlled movements of muscle groups. Fine motor skills involve tasks that require dexterity of small muscles, such as buttoning a shirt. Tasks such as walking or throwing a ball involve the use of gross motor skills.